It’s six and counting for the Liberal Bee Jays. 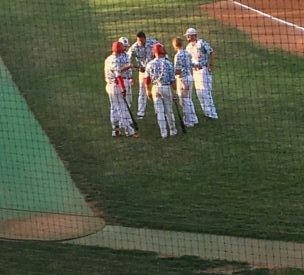 The BJ’s knocked off the Great Bend Bat Cats 7-1 Saturday night in front of a big Brent Gould Field crowd for Kids Night. Sam Beattie (2-1) pitched six strong innings for the win without walking anyone. Beattie did not allow an earned run. Derek Craft went two scoreless innings. Zach Autin made his BJ debut with a scoreless ninth. The Bat Cats scored first with a run in the fourth. The run was unearned as Liberal committed two errors. The Bee Jays took a 2-1 lead in the fourth. Zac Cook doubled before Garrett Scott singled him home with a ground ball to left. Colton Onstott lofted a double off the wall in right center against the wind. Liberal added three in the fifth. Gage Teer singled and advanced to second on a balk. James Hardberger doubled to left center to score Teer and make it 3-1. Cale O’Donnell singled home a run to give Liberal the 4-1 lead. Zac Cook scored on a wild pitch. Liberal added two in the seventh with two outs. O’Donnell singled and Scott walked. Onstott reached on an error to score a run and Jaron Robinson singled home a run. Liberal has won six straight and is 9-3 in the Jayhawk while Great Bend is 5-8. The same two teams play Sunday night at 7 at Brent Gould Field with the Dugout Show at 6:45 on 1270 and kscbnews.net. Madden Oil and Ruffino’s are the buyout sponsors.